Selectively offer seed to small songbirds with this Heritage Farms Absolute III Squirrel Resistant Weight Sensitive Bird Feeder. 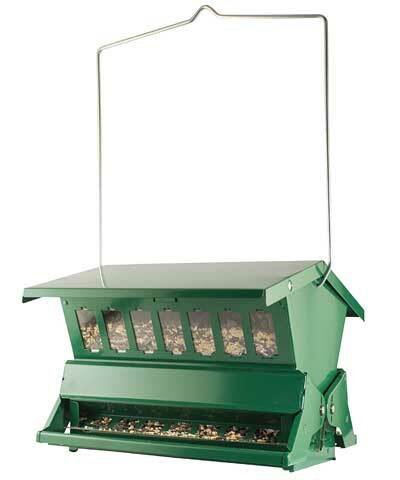 The durable, steel body creates a lasting feeder, and its generous capacity helps your feathered friends remain well fed. The center chamber of this unit holds 8 quarts of bird seed, and plastic windows on the front and back make it easy to monitor the levels. A trough beneath these windows creates plenty of feeding spots, while weight sensitive, metal perches allow small songbirds to stand. When a squirrel or other animal places its weight on the perch, a metal shield covers the seed ports, preventing them from dining. Calibrate the sensitivity on these perches to discourage larger birds as well as squirrels. The roof locks in place for an added deterrent, and swings upward for easy refilling. The bold green, powder coated finish perfectly enhances your landscaping, and an included, metal hanger makes placement simple. Attach the included, plastic mounting plate to the base of the feeder to pole mount it for a different look. Feed several birds while discouraging squirrels from dining with this Absolute III Squirrel Resistant Weight Sensitive Bird Feeder. Made in the USA.